Here's an ergonomically shaped Adjustable Mop Handle, from Rubbermaid®, that takes the back strain out of mopping! The handle has a slight bend near the top that swivels 360° to provide a good grip that doesn't require bending over to achieve. 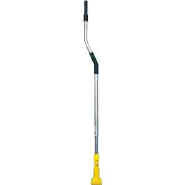 Adjustable Mop Handle is made from corrosion-resistant aluminum and adjusts from 54" to 66".